The 2012 Kingman Spyder Victor Semi-Auto Paintball Gun continues that tradition. The quick strip top cocking bolt and tool-free rear plug allow the player to do most required cleaning and oiling in under 5 minutes. Spyder TL-R Paintball Marker Gun with Allen Case & Extra Barrel, Hopper Accessories. Used, Does Dry Fire, No Further Testing. This is a used, donated item that has not been cleaned, serviced or tested for functionality. It is in overall good condition with only a few minor scratches and blemishes. Comes with everything pictured velocity adjustment tool, paracord sling, spare o-ring and parts kit, 2 barrel tips, feed neck with 50 round hooper and two 50 round pods, also compatible with first strike rounds. The military-style Spyder MR1 Paintball Marker is known for its ability to avoid double feeding and annoying jamming. This marker gun‘s toughness derives from not only its workings but also its design, which allows it to take a beating and keep on performing. HAS A 16" BARREL. GOOD CONDITION. YOU GET WHAT YOU SEE IN PICTURES. HAS A 14" BARREL. GOOD CONDITION. YOU GET WHAT YOU SEE IN PICTURES. Spyder Imagine Paintball Gun E-marker - Green With Extra Long Tubes Excellent. Condition is Used. Shipped with USPS Priority Mail. Up for sale is a used Spyder MR 100 Paintball Marker. It has been used and show little sign of used from normal play. It has been tested and everything is in proper working order. Spyder VS1 Paintball Marker Electronic Gun Working Excellent Condition. Condition is Used. Shipped with FedEx Ground or FedEx Home Delivery. Spyder Fenix Paintball Marker. Condition is Used. Shipped with USPS Priority Mail. Used, Black/Blue, 0.68 Caliber Electronic Paintball Marker. MR100 Features. 68 Caliber Military Styled Paintball Marker. The MR Series continues the high standard set forth in every marker's strength, reliability and durability. One Piece Velocity Adjuster/Spring Guide, Anti-Double Feed Ball Detent, Steel Braided Hose, Operates on CO2 or Compressed Air. Spyder Hammer 7. Custom modded into a bolt action sniper rifle. Mods include a thordsen stock with air tank from rap4. Noveske handguard with magpul grip and 45 degree iron sights. 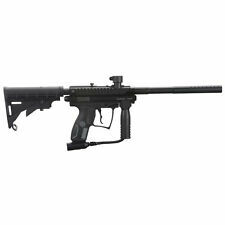 The paintball gun has rap4 fps barrel made to shoot first strike rounds with a noveske sound amplifier muzzle break. Also will come with a apex 2 barrel for paintballs fits with current noveske handguard. Random scope. Will come with 7 hammer 7 mags and shotgun pump if u ever wish to switch back to pump action. It has 3 different modes: Single, Burst, & Full auto. Everything works as it should. Nothing besides compressed air has ever been shot through this gun and it’s in great shape, but check out the many pictures to judge the overall condition. Condition is Used. This paintball marker has NOT been tested and is sold as-is. Paintball Marker. Two paintball pods - one small (holds 100 rounds), one large (holds 150 rounds). Works perfectly. Very rugged and durable gun. Spyder Flash in Great Condition. Purple/blue. Powers up, shoots, electronic and manual safety works, all screen displays work including electronic counter, minimal surface marks except at trigger area has slight wear. Comes with case (clear case area cracked) matching barrel and barrel plug. In good used condition. Look Over Pictures to Judge the Quality. This has not seen much use. The sear looks practically unused. Preowned but still in great working condition! Kingman Spyder Victor Paintball Marker Green. You are buying a paintball gun Spyder Victor with hopper and barrel covered In cammo tape. You can remove it if you wish to have a different look. gun has been tested and works. Used sold as pictured with no returns. Please ask any questions before you buy it. Being sold by reputable paintball dealer (PB Sports ). Spyder Victor. Diamond Black. Pull Pin Top Cocking Delrin Bolt. Steel Braided Hose Line. Two Finger Trigger. Anodized Matte Finish. Operates on CO2 or Compressed Air. Spyder Pilot ACS Marker Paintball Marker Gun. Condition is Used. Shipped with USPS Priority Mail. Has pink details on scope & handle. *USED* Spyder Victor .68 Caliber Mechanical Paintball Marker Gun - Olive. Condition is Used. Only the gun, no mask tanks hoppers etc. Spyder MR100 Paintball Marker. Condition is Used. only have one glove Shipped with USPS Priority Mail. Spyder Pilot ACS Paintball Marker Paintball Gun. Condition is Used. Shipped with USPS Priority Mail. Tested & works! Includes charging cord! ONLY comes with what is pictured. It is still a great deal. However, this being said, I am still a human, and may make a mistake. I am VERY EASY to talk to. I pinkie-swear that I am not trying to swindle anyone out of there money. New ListingLot of 9 PAINTBALL CO2 Tanks,3 - 12-oz., 4 - 20oz., 3 - 9oz, ALL Refillable ! You are looking at a Lot of 3 Spyder CO2 Tanks, 12-oz., Refillable ! The Spyder Xtra was redesigned to fit the needs of the serious recreational player. With many standout features, Spyder Xtra Paintball Marker proves to be a great entry level marker because of the air-efficient Eko valve system, all aluminum construction, and redesigned milling for easy cleanup. MR100 Features Maddog Deluxe 4 1 Harness.68 Caliber Military Styled Paintball Marker. Anti-Fog Paintball Mask. 4 - 140 Round Paintball Pods. 200 Round Paintball Loader. These cities include (but are not limited to) Boston, NYC, Washington DC and other surrounding areas. Huge lot of paintball guns and accessories, listof objects. 5 barrels different lengths and colors. The complete guide to paintball book. 4 view finder paintball storage with belt holder. 2 spyder xtra guns. Great guns, but they need new o ring kits because I haven’t played in awhile. And the smaller guns safe is missing, but the gun still works. No longer playing. Used Spyder Fenix Paint Ball Condition is Used. Gun comes with multiple accessories. Paintballs, Viewloader, Mask, Cleaner Sticks and barrel plug. Gun has had battery placed in it and tested, but not air. The battery up as it should and worked on multiple settings. Noted that gun will be broken down minimally for shipping. Mask has some scratches, there are some typical use scratches nothing extremely major. Gun looks really well taken care of. Works and looks great- very little wear- see pictures. Spyder TL-R Paintball Marker. Condition is Used. Breakdown pin lock is missing and replaced with safety pin (pictured). Shipped with USPS Priority Mail. Deadly wind 14" carbon fiber barrel with. 685 caliber insert from Empire and a Lapco Cocker-to-Spyder thread adapter. Shoots wonderfully and is just a totally different and fun gun. Extra parts include vertical feed adapter, picatinny heat-guard, detents, extra screws, velocity adjuster tool & user manual. Everything works great. With the low recoil of the marker the ball maintains a more accurate flight path. You can use CO2 or Compressed Air. Do not use. 68 cal paintballs. BONUS 500. 50 paintballs INCLUDED! Lot of 9 PAINTBALL CO2 Tanks,3 - 12-oz., 4 - 20oz., 3 - 9oz, ALL Refillable ! 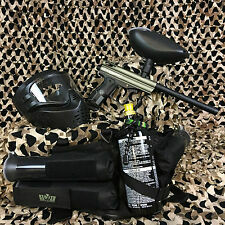 When it's time for a paintball battle, different types of players may need the tactical advantage of a solid paintball marker or gun that is created to waste no ammunition. 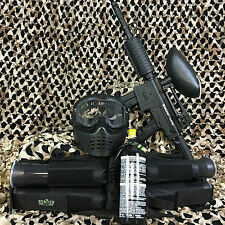 Since 1992, the Kingman Group has produced paintball markers for the serious player. If players are ready to find a new gun, they might consider the Spyder line for the next scenario. 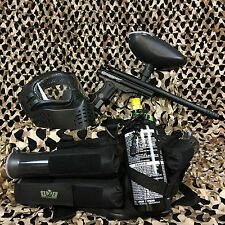 What types of Spyder paintball markers are available? Spyder makes paintball guns for all players with almost all of their models designed for new and intermediate users. From training pistols to electronic and military styles, the guns have a solid appearance and are created to perform well. Spyder Training 0.43 pistols: Known as the KT, the paintball guns are semi-automatic and use magazines that are fed by hand. This paintball gun is good for scenarios where all competitors use the same pistol. Spyder 0.50 markers: The 0.50 paintball and paintball guns are meant to strike with less force, making them a hit with youth warriors as well as families. Spyder 0.68 markers: One of the more advanced markers for paintball, the 0.68 has options such as electronic guns, pump-shot shooting, and high-quality scopes. How do you clean a Spyder paintball gun? Remove the barrel: When removing the barrel from the paintball gun, the marker should slide out as well. Keep these pieces in a safe place. Remove the string: The string, bumper, and striker will need to be taken out after the barrel. Clean the parts: Use paintball oil on all of the removed parts. Don't use other types of chemicals as they will cause damage to the pieces. Replace the pieces: Place the clean parts back into the paintball gun. Test-fire the paintball gun to make sure that everything is working properly. Does Spyder make different styles of grips for the gun? If players decide that they would like a different grip style or design, they can exchange the previous grip for a new one. Other grip options include the ability to fold and adjust positions. Once they have their new grip, they can simply remove the old one and insert the new grip. Are the Spyder markers compatible with holsters? There are as many paintball gun holsters as there are markers. From hip, leg, and vest to shoulder holsters, the Spyder marker will be compatible with virtually all of them. Players can find a holster that is light enough not to weigh them down but is still durable enough to go the distance. Content provided for informational purposes only. eBay is not affiliated with or endorsed by Spyder.